GQA Qualifications: Competence. Now there’s a word. Competence. Now there’s a word. What does it mean? How do we get it? Can I buy it? 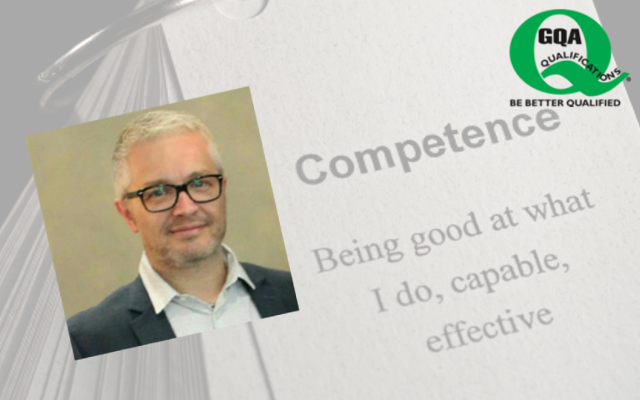 Once I have competence will I always be competent? Slightly different but collectively confirming that competence is about ‘doing’ and ‘ability’. So we’ve got an idea of what Competence is. How do we get it? How do you get the ability to do ‘something’ successfully or efficiently (let’s use the Oxford definition for now)? Depends what ‘something’ is. Can you be born with it? Can you borrow it? Can you buy it? You could certainly be born with a talent that can be perfected with practice – think sport or music. People who are successful in these areas generally ‘just have’ that talent – yes you can work hard in these areas but there are those people who are naturally gifted (born with it?). But what about a job? A practical trade? How do we ‘get competent’ in a job or a trade? As children we will all have said that we want to be a footballer, or a singer, or a movie star and so on, but then, apart from the lucky few with natural born talent for the more glamorous occupations, we become realistic and start looking at what jobs we can do now that we’re ‘grown-up’. People’s interests as children will give them a steer as to where they’re going next and lead them into employment. Am I competent at this point in time? Is it possible? Well how do I get competent? Your employer (or prospective employer) may be a big believer in talent development and already have you mapped out through a course of college study and learning, your employer could be an advocate of real apprenticeships and have you registered with a vocational training provider who will work with you to introduce you to the knowledge and practical skills to enable you to do the job. Your employer could know everything there is to know about your chosen vocation and have the time to ‘teach’ you. Perhaps your employer just lets you get on with it, to work with your colleagues. Job experience is a huge part of becoming competent. You need to be doing the job to understand what you are doing and why you are doing it. A structured learning programme will ensure you’re learning the right information, practices and processes and in the right manner. So am I competent now? Depends. What is your chosen vocation? What does competent look like in that job? Do you need lots of practice / experience? What is your ‘something’ (there’s that word again)? Perhaps an Office Junior? Filing, typing, answering calls – all important parts of the process. Perhaps you’re a Computer Programmer with the ‘ability’ (seen that word before as well) to understand the language and turn that into developing complicated applications. Perhaps you’re a Brickie? Or a Joiner? Or a Window Installer? SO! Am I competent now? The learning that’s taken place, both understanding and practical, will have stood you in good stead, shaping the way that you do ‘something’ (there’s that word again). The learning should have been guided by national standards and regulations. Such as qualifications. And Building Regulations. Someone needs to make a judgement on your ‘ability’ to do ‘something’. That someone should understand your ‘something’ and understand how to make ‘judgements on ‘ability’. Maybe that someone should be a person qualified to make judgements on ‘ability’? That judgement also needs to be against industry developed and agreed standards. Depends what you mean by ‘Can I buy it?’ You can invest in your own development; your employer may want to invest in your development. You may even be able to access Government funding dependent on your circumstances to assist with paying for development. There are those people that want to invest in ‘ability’ and earn their competence to benefit their employer, their business, their industry and themselves! Whichever of the above it is, there is a clear investment in ensuring that you have the ‘ability’ to do your ‘something’. On the other hand, there are those who want to be competent now. Those that think they’re competent just because they’ve been doing the job for a while. Some people don’t want to put the effort in and understand why they’re doing their ‘something’ in a certain way and within industry set guidelines and regulations. Others don’t understand that just because they’ve always done ‘something’, it doesn’t mean that that ‘something’ is the right way to do it. I’m now competent. What’s next? Great. Knowledge, skills, commitment and more than just an interest in doing your ‘something’ right. I’m guessing it wasn’t a difficult process – yes there was some learning to do and yes you had to talk to someone else about what you were doing and why you were doing it. I’m also guessing that on reflection, you picked up some tips on best practice that will no doubt help when you come up against problems in the future. Keep it up. Lifelong learning, Continuous Professional Development (CPD) – might seem like buzzwords that only colleges or Government speak about. But why can’t it apply to you? Keep up to date with changes in regulation, legislation and best practice. That updated knowledge and skills will keep you doing your ‘something’ successfully and efficiently (Oxford Dictionary). In some occupations CPD is mandatory. Look at Plumbers, Electricians and Marketing and Human Resource Professionals. In others it is advisory. There are some occupations that need regular confirmation of knowledge and there are others that need confirmation of both knowledge and practical ‘ability’ – depends on Government legislation and the ‘something’ that is being done. But so what if your ‘something’ isn’t covered by Government legislation; don’t you want to be doing it right? Don’t you want to understand what you’re doing and why you’re doing it the way that you do? Don’t you want to have the confidence that if there are problems, you understand what to do next and can do it? Don’t you want to use your ‘competence’ to stay employed, to progress, to earn business? So competence is being able to do ‘something’ successfully and effectively, or efficiently – to borrow from established dictionaries. How do you know if you’re doing ‘something’ efficiently? That’s what standards are there for. Developed and agreed by the industry and used by providers, colleges and centres as they deliver nationally accredited qualifications to confirm competence. ‘the ability to do something correctly, measured against an industry agreed standard, especially where experience and training are the main source of ability. (Encarta – and GQA).